Cover Art - 4: I'm not a fan of letters on covers, but I'd be lying if I said that I wasn' t intrigued by SPECIAL LEX LUTHOR ISSUE. Not that I'm biased or anything (cough cough HOOEY cough cough), but I likes me some Lex. Still, Lex bias aside, this is a heck of a pose, an interesting format, and though it didn't happen in the issue (minus one), it is still one of those covers that the dynamic makes up for the inconsistency with the issue. It's a rare thing, but I find them every now and again. This is one. Interview - 4: I've flayed the last few issues, and even the special, for doing a kitchy interview schtick with the main players, mostly because they are self-congratulatory pieces of teeny-bopper such and so. This one had its fall-in-line-with-the-teeny-boppers moments, but largely, it was Michael talking about the direction Lex would take, talking about daily acting on the set, and the nature of Lex's evil. Unlike the previous interviews, this one is a step forward, rather than backward. That said, it is low on spoiler material, because Rosenbaum doesn't get the info, so that takes it down a notch. But for an interview, I actually DIDN'T want to put it down. That's a first with this series. Though I have to wonder.what will they do when they run out of cast? Interview the same people again? And there is also one REALLY cool part of the interview...talking about how bad a guy Lex is, Rosenbaum points out that Jonathan Kent is always a mean guy to Lex and has been in jail a number of times. This is a great in-joke to those of you who read my Smallville show reviews.I'm always lumping on the show for knocking people out and throwing them in jail again and again and the like. I thought it was funny. Rosenbaum seems more fan oriented than the rest of the cast, more into comics, for sure. I sent him a SASE for an autograph (a first for me, that's how much I like him) and he hasn't gotten back to me yet in a few months, but this kind of interview tells me that he's a fan favorite for a reason. Photos - 3.5: I say 3.5 of five, but I've put the 4 shield there, because it's leaning. I'm usually not so torn over things, but there are four pictures. Three are average, and one, the one with Lionel and Lex looking straight into the camera, is really dynamic and cool. Clark and Lex share coffee a short time after Jonathan is accused falsely of attempting to kill Lionel. They recall how Ethan was the real killer, and how difficult Dominic was to deal with. Lex gets a call from Metropolis, and excuses himself to go see the man who called, his old friend from prep school, Malcolm. His ONLY friend from prep school. He's been doing hieroglyphics from the Kawachi caves for Lex. Clark tells Lex not to forget his own birthday. When Lex goes to his friend's apartment, he finds him dead, on the floor, with one of Lex's knives in his chest. He also finds letters from Lex Luthor, letters he hasn't written, on the floor, threatening Malcolm. He calls the police, takes the evidence, and leaves. Clark encourages Lex to turn himself in, even though he knows that he is innocent. SWAT team goons blow through the window and surround them, taking Lex. Clark throws off the goons and runs after Lex, who they are throwing into a van. They shoot Clark with semi-autos as they close the door on Lex. Lex is horrified. His only two friends are gone. In the van, men claiming to be government agents ask him why he killed one of their agents. They beat Lex soundly, but Lex knows nothing. They ask him why his bank account is empty. Lex chides that they can't kill him. When they agree, he says, "Then there' s nothing to stop me from doing this!" And head butts the lead goon. They knock him out. He wakes up in a cell. It is Lex's birthday. Clark bursts in, showing Lex that the guns were firing blanks, that the cell and government is just a set, and that indeed, his bank account is empty. Lex thanks Clark and tells him to go home. Lex then finds his father, with a gun, and demands to know why he set Lex up for this madness. Story - 5: Where was this story in the first few issues? This one was GREAT! I mean, I'm a Lex freak, but this is just in character, full of twists, extrapolating on continuity, fun! I loved it. Lex confronting issues that is avoided at times in the show...what it will be like when he loses friends, when he is a killer, when he has to take on his own father. I'm aching for the next part. This one rocked. Art - 5: People email me and can't stand that I like this art, but I do. It's not exaggerated, it's not even comic book. But it is Smallville. It's also spot-on for the characters in question. In some cases in previous issues, this has been overdone or underdone, but in this issue, it's right. Check out that last page. Lex has NEVER been drawn so close to form for me. I've seen him make that look on the show when beaten, tired, at the end of his endurance. What I want to know is how they channeled Rosenbaum. This little chunk of comic book forces me to do something that I am not very comfortable with, but bear with me. As some of you may know, I write novels at the very heart of what I do seriously. I write poetry, reviews, short stories, movies, comics, I write all kinds of things, but I like to think that the thing that I do best, the thing I know best, is writing books. So I take myself out, here, and look at this excerpt on two levels, writing and plot. Writing - 1: Speaking as a professional writer (unpaid, so take that for what you will), I can very easily point out how horrible the writing on this piece is. How genre. How designed for those who can barely read, and if they can, lack the patience or foresight to understand what good or bad writing is, yet. Take a paragraph, which I shall now pick at random from the excerpt. "He walked back to the desk. Even though this office wasn't his, it bore his stamp after twenty-four hours of work. Several empty cappuccino cups, a half-eaten Danish, the remains of a pizza ordered in the middle of the night. Crumpled papers lined the waste basket, and the blotter was covered with his doodles." Okay. This excerpt isn't so horrible. Still, there is room for loads of improvement. Rule one of a good story? Leave out anything unnecessary. I'm a minimalist, and a realist writer, so if you're of a conflicting school, bear with me. Meaning, the only necessary part of this whole paragraph is the sentence "He walked back to the desk." Which is, in itself, rather passive. The whole passage is passive. "Lex walked back to his cluttered desk." Is an improvement. I would write it: "Lex's cluttered desk greeted him." That kills two words, uses tighter writing, and tells us everything that the last paragraph did, essentially. Minus 49 words. There's also the passive of this passage. It's a problem with most, if not all genre fiction. Everything is so passive. Is, are, was, were, am, be, being, been. Has, have, had. And, but, or. The enemies of most good minimalist, realist, literature writers. "Lex made himself swallow hard." No. Lex swallowed hard. Don't be a wuss. "Lex realized he was holding his breath. He let the air out slowly, remembering the yoga calming techniques he'd learned at one boarding school or another." No. Lex held his breath, then let it out. Calm. Yoga. Focus. We don't care about his one boarding school or another any more than we care about what he WAS doing as opposed to what he IS doing, without the IS. You want to tell us about his boarding school? Write a story about it. It's tangential. Don't even get me started, quickly, silently, ingeniously, and meticulously, about all of the unnecessary adverbs and how they should be crushed with the mallet of good writing. Writing is a craft, and this was crafted for mass market and the non-picky consumer. I abhor it, as I abhor most things below my own talent level but paid for ten times that which I am. I could go SO much farther, but it's not worth it. Trust me. Many years of examination. Plot - 4: This will do what it is designed to. Interest an adolescent who already likes Smallville into buying a book to read during the times their teachers force them to read. And it will keep their attention, even though the writing is horrible. Because this is plot driven, and in such, it will do its job. Photos - 3: It does its job. It's a cover for the book we're reading. Nothing special, nothing horrible. Lana is surprised to find Lex visiting her under the pretense of finding figures from the Talon. Really, he just wants to see if she's all right with regards to her parent's anniversary. Lex tells her that he sold his horse when his mother died. Lana questions if her real parents were even in love. Flashback to a younger Lex talking baldness with his similarly afflicted mother, smitten with cancer. She makes him put on a hat, because he's putting her to shame with his looks. They are celebrating what Lex thinks will be her last trip to the ranch. They move to round up the cattle, but Lionel lands, disrupting their pleasant time. Lionel criticizes Lex's hat. Lex's mother is positive about the whole visit, not disgusted by Lex, as Lionel hasn't shown for the annual cattle drive for seven years. Lex's mother send him off to get a stray calf. A snake creeps up on his mother's horse, and spooks her. The horse flies off, and she's about to fall when Lionel swoops in on a horse and saves her. Lex tells Lana that over the next few days, the cynicism returned, but for once, through the goodness of his mother, his father lost his evil. He tells Lana that even if her mother and father had bad times, commitment can bring the good from the evil. They visit their respective lost family. Story - 5: This issue is turning Smallville: The Comic around for me, single-handedly. 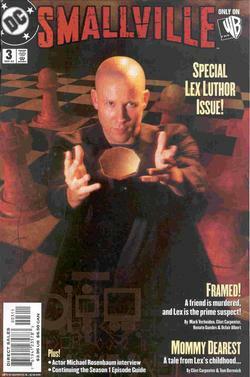 I cannot believe how thematic and well-put the last two stories have been towards the Lex mythos. We see Lex's mother, which is nice, but we also see how Lex, or a form of Lex, a bald, dying, positive form of Lex, can find the good in his father, or even in the world, through commitment. A precursor to Lex's fall that is poignant and twists the knife. I'm impressed. Art - 4: Not as good as the last one, a little cluttered in the paneling, but still, rather well done. And Lex's mother is pretty spot on with Lex. It's nice. Article - 3: Pretty average. The one on this website (again, shameless plug) is better, in my opinion. Photos - 3: Typical. Not bad, not good, just cursory and there.